Are you at a loss at the end of a busy day and feel like you have accomplished nothing? Feel distracted by interruptions including co-workers and email? Whether you work at home or work outside the home, it’s time to be proactive about your time. It’s the distractions and interruptions that take away a lot of our time, as well as the last minute requirements from those around us. 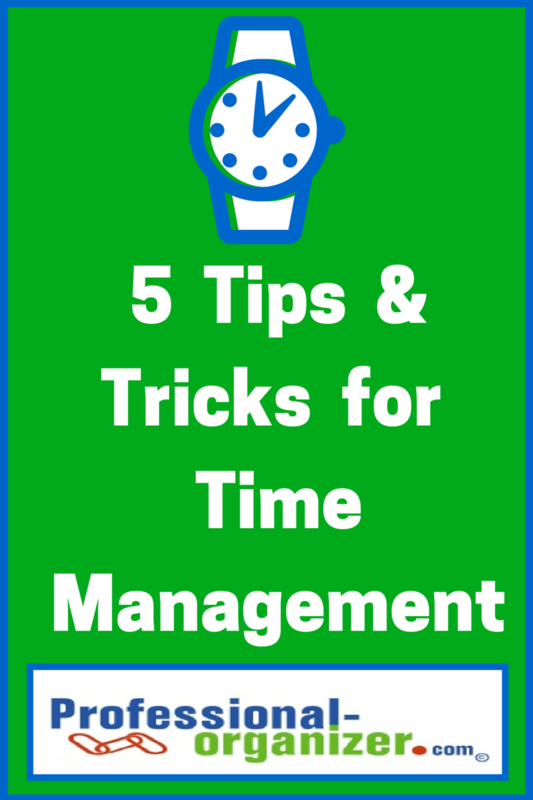 Here are 5 tips and tricks for time management to get you started on difficult tasks and project. It can be hard to know how long a project will take. Mapping out a plan can help. Write out each step and the amount of time it will take to complete. Assign completion dates, including the final completion date. Get started on your project by breaking this into manageable pieces on your calendar. Start early to give yourself a buffer. Setting a specific time can help you start or complete a project. Just like an appointment with a doctor, setting an appointment with yourself helps you work on a specific task. Block out the time and keep it sacred to use for a task that requires lots of brain power. Start with the first time slot of the day so you can be sure nothing interrupts you too. Our jobs require so many different activities and focus. Set a day of the week to do a certain task or project all day. It might be Money Monday or Financial Friday. By having a priority for the day, you can put aside other details and distractions. Or leave Monday or Friday open just to close the loops and projects. A time timer or kitchen timer can help you start or finish a task. Set it for 15 minutes and just do it. Set the timer three times like this and you have worked 45 minutes total. If you need more time, start this process again the next day. My favorite tip for starting and completing projects is a power period. It is a one hour slot of uninterrupted time to work on difficult and thoughtful projects. It works for me because in an hour I feel I have accomplished a great deal. Then I can give any project time to percolate and some back refreshed with a new perspective on the work. I use as many power periods as I need to reach completion. I start very early on projects so I have time to add at the end, just in case. What tips and tricks do you use for productivity and time management? One of the most powerful parts of social networking is the connections and collaborations we make! I asked my social media peeps to share their small and big changes this year. I loved learning a little more about each of them and what the new year holds for them. My expectation for 2014 is to train myself to just “GO”… When it comes to projects/ideas/dreams, I am strong at “ready” and “set,” but often flail in the action. Fear and self-doubt are two big enemies. What am I afraid of? I plan to achieve both personal and professional growth this year taking “go” to the next level. I will stop second-guessing the outcome and just do it! One of my three words for 2014 is Nourish. For me, this covers a multitude of areas – health, fitness, stress management, life management and self-care. Instead of saying I’m working out so many days a week, I have opted for the overall theme of Nourish. As I make both small and big decisions in 2014, I ask myself: Does this Nourish me? As Jason Womack says, I’m giving myself the gift of my own attention. This year I have sent my mind to become better at 3 things: golf, yoga and painting. 2013 was a big year of change for me both personally and professionally which left me working all the time! One big change I am taking small steps to do is to not work as much. I only have a few years left before my kids head off to college (or whatever awaits them after high school) and I don’t want to look back and say “I wish I had spent more time with them”. So far it is going well… keep your fingers crossed. 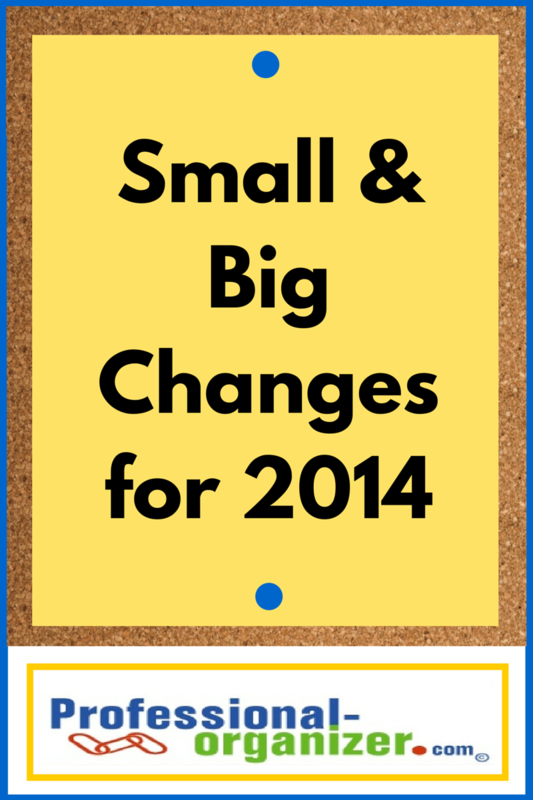 What are you small and big changes for 2014? A new year means a fresh start! Each year we want to be more efficient, effective and productive so we can be more balanced and be our best. It’s the combination of many tools, tips and techniques that help us with our productivity. Review this list of 14 productivity tips for 2014 and see the strategies you are already using and those you would like to use to create a new habit. 1. Commit to a calendar you love. 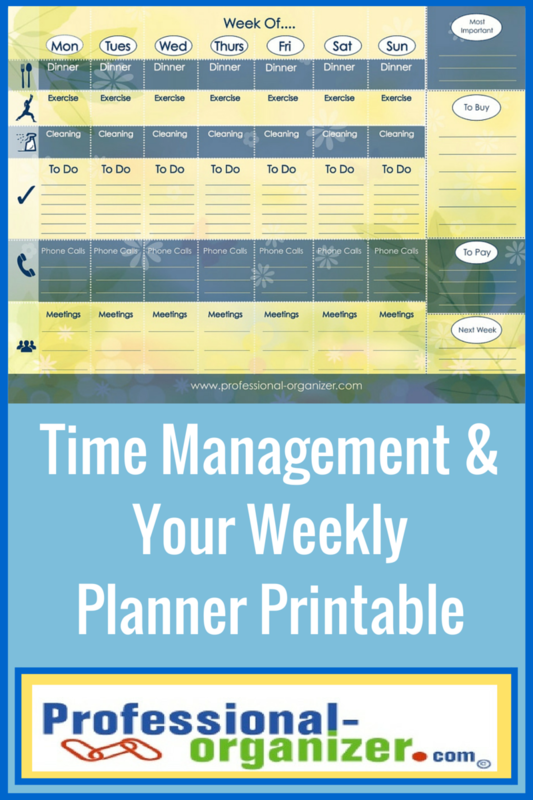 A calendar not only helps you keep track of meetings and tasks, it also helps you create a plan for your week, month and year. 2. Record recurring events on your calendar to remind you about important dates. These can include credit card and bill paying dates, expense and health flex plan due dates, and birthdays. Using your calendar as a tool for tracking doubles its value to you. 3. Lists make life easier. Write stuff down to be free up your mind and be ready to work. Use a spiral notebook or Evernote for lists. Move tasks from email, post-it notes, voice mail or texts to one list to keep track of all you need to accomplish. 4. Create checklists for weekly and monthly activities at home and at work. Checklists are a great way to not re-invent the wheel. It keeps you on track for projects and tasks that occur regularly, as well as getting things done throughout the week. Easy to use checklists include grocery lists, travel lists, bill paying ledgers, and end of the month work checklists. 5. Choose the top three of your Most Important Tasks (MITs) each day to accomplish. How do you know what’s most important? It is the priorities you set. In business it is usually about finances. Personally it is about family and values. Choosing just three MITs a day ensures your success. Whatever is the first task of the day is the one task you can be sure will be accomplished. 6. Set up a Power Period each day, as least once a day, without distractions. A power period helps you get tasks done, helps you be more creative, and helps you complete difficult tasks and projects. 7. Triage email three times daily and add tasks from email to your action list. It’s easy to spend too much time on email so keep to a schedule to use your time more effectively. 8. Create a command center for your papers. Triage papers daily and set a one hour weekly admin time for paper at home. Having a center where papers that require action are altogether makes it easy to find them and do what is required. Spending a little time daily and one hour weekly helps make sure nothing falls through the cracks. 9. Establish weekly routines at home and work. At home these include what days are grocery shopping and laundry. At work these include weekly reports and staff meetings. You can assign days like Money Monday, Wash it Wednesday or Financial Friday to keep it fun too! Write these on a checklist where you can see your assignments for you and your family. 10. Leave a little white space in your calendar for relaxation and rejuvenation. Many tasks do not go as planned. Back to back activities wear us down. Having a little time between tasks and activities lowers your stress. 11. Declutter your purse, satchel, backpack and your car weekly. Declutter your purse at your command center. Declutter your car while you are getting gas. Help your kids declutter their backpacks into their binders. It takes just a few minutes to do. Sometimes it is just trash that needs to be tossed, addresses and contacts to put in your smart phone, and cosmetics to put away. Just five minutes makes all the difference. 12. Host a weekly family meeting. Family meetings are when everyone shares what is going on and what they need to accomplish. It creates family cohesiveness and a team effort. 13. Post a family calendar in the kitchen for everyone to add their activities and remind everyone of upcoming events. Your family calendar helps everyone work together and be on top of upcoming activities. 14. Create partnerships at home and work. We are all especially good at some things and not very good at other things. When you are partnering, both you and your partners strengths come out, work gets accomplished more quickly and its more fun. Partnerships at home include making dinner, doing the laundry and doing the dishes. Partnerships at work include all types of project management, weekly meetings or monthly or annual reviews. The key is to communicate clearly and work together cohesively. Nothing feels better than getting things done! School is in full swing. Your kids have after school scouts and ballet. Your work requires extra hours and your partner travels. How do you pull together your family for cohesiveness an collaboration? It’s time for your family meeting! 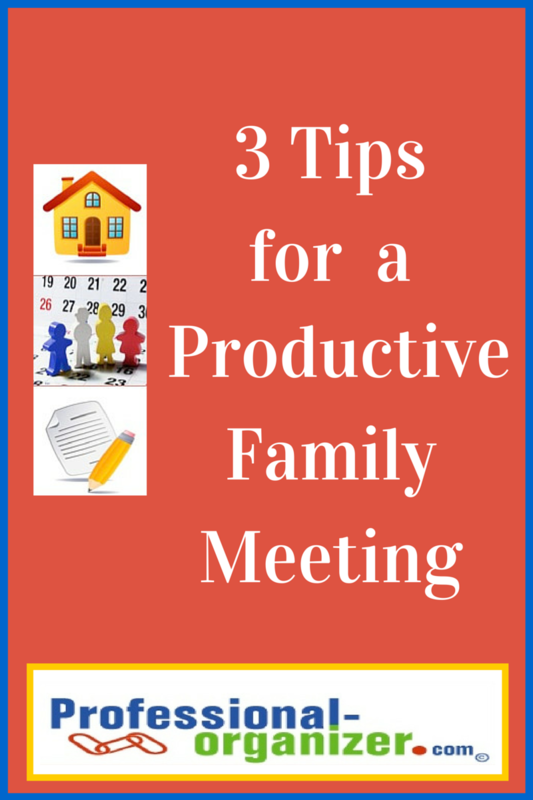 Follow these three tips for a productive family meeting. What is a family meeting? It’s a time everyone gather together to share their upcoming activities, share family responsibilities, plan ahead as a family and have some family fun. Set aside the eye rolling from either your kids or your partner as family meetings are an important way to stay on top of what is going on and prioritize your family unit. Next move on to family fun. Alternate who gets to choose the fun, including mom and dad. Have a list of possible activities, in case there is dissension. Whether it is a good old fashioned kick ball game, a walk, or a fabulous dessert, focus on positive communication and sharing. There are no wrong answers to having fun! Acknowledging feelings and active listening create collaboration in families. Promote a team attitude by working together and playing together. Family meetings can be any time of the week. Setting aside a time to meet consistently is important. It can be when your family is gearing up for the week, such as early Sunday evening. It can also be when you are gearing down from the week, like Friday evening. Be sure it is a time everyone can attend and guard this time from other distractions. My own kids recall our family meetings to this day! It has sparked their own versions in their homes, including High, Low and Dirt. This nightly conversation starter in my son’s home has to do with what was good, bad and just plain interesting in their and their kids’ lives that day. When can you start hosting a family meeting in your home? Join me on my pinterest board with Command Center for Communication.